The split sole tap shoes are designed to provide flexibility, foot articulation, and ease of toe stands while tap dancing. The shoes feature Tele-Tone taps that are pre-mounted to both the heels and the toes, a moisture absorbing micro-fiber lining, a memory foam insole, and a strong toe box. 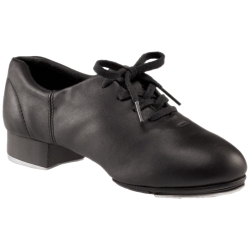 The split sole tap shoes are available in black. Women order your street shoe size, men order two sizes up.